European leaders have mostly stayed silent. Neither Francois Hollande of France nor Angela Merkel of Germany have spoken out about major Turkish infractions of justice and free speech. 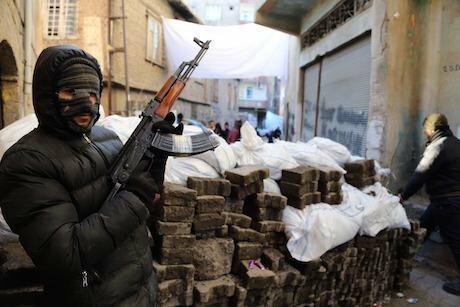 A PKK militant stands at a barricade in the city of Diyarbakir, Turkey. Murat Bay/PA Images. All rights reserved.ISTANBUL – The lights went out as we sat in the Istanbul offices of Punto 24, a not-for-profit set up to encourage independent reporting in Turkey, discussing the plight of local media facing the most intense crackdown for years. “This could be a wake for the Turkish press,” Andrew Finkel, a P24 founder, said gloomily as his colleagues placed trays of candles on the table. President Recep Tayyip Erdoğan’s move to consolidate power just three months after his party won a fourth term includes an intense crackdown on media and a hostile work environment: TV stations taken over, journalists jailed, and a newspaper building attacked. Amid the physical destruction unfolding mostly unreported in southeastern Turkey with the resumption of conflict with Kurdish armed groups, a swift and steep decline in press freedom threatens the country’s health. And yet, Europe has done little to respond to the crisis, or even to sound the alarm. Emma Sinclair-Webb, Human Rights Watch’s senior researcher in Turkey, described pacing along outside the fortified walls of Diyarbakır’s old town to the sound of tank fire and explosions from within its narrow, winding streets, because she was not allowed into the city. Who knows what stories are going untold in Turkey? Mainstream media coverage of the fighting in the southeast, where government forces are besieging Kurdish towns in their renewed conflict with the outlawed Kurdistan Workers’ Party (PKK), trumpets military assaults that “render the terrorists ineffective” while mourning soldiers who are “martyred.” Every day, Twitter and Facebook users post dramatic accounts of wounded civilians, including children, trapped and untreated in cities in the southeast because ambulances can’t get in, and the injured can’t get out. The situation in Cizre is so dire that in the last two weeks the European Court of Human Rights issued several extremely rare interim rulings – special measures – calling on Turkey to evacuate the wounded to protect their lives. Relatives say that four of the five named in the European court rulings are now dead. In the case of wounded people stuck in a basement in the town, government officials say the ambulances can’t drive the few hundred meters to rescue them because of PKK snipers, while Kurdish politicians say the military and police have prevented ambulances approaching. Most of the Turkish media has largely chosen not to report on the plight of trapped and injured civilians in Cizre, leaving the Kurdish press to produce reporting that can’t be verified. The government has arrested at least five Kurdish journalists in the past two months, and has blocked several websites. But the risk is not only about exposing a subject unpopular with the government, the danger is also physical. On January 20, Refik Tekin, a cameraman from IMC TV, was shot in the leg by Turkish police who opened fire on a group of civilians waving white flags and trying to evacuate several dead and wounded from Cizre. Tekin kept filming, even after being hit. As he lay in a hospital bed the prosecutor announced Tekin was under investigation for being a suspected member of an armed organization, although it didn’t seem he was a member of anything other than the press. “Filming an atrocity is not a crime, but shooting unarmed civilians most certainly is,” the UN human rights chief, Zeid Ra’ad al Hussein said on Monday, in a statement about the situation in Turkey. It’s just as hard to get solid information from Diyarbakır, one of largest cities in the region. Emma Sinclair-Webb, Human Rights Watch’s senior researcher in Turkey, described pacing along outside the fortified walls of Diyarbakır’s old town to the sound of tank fire and explosions from within its narrow, winding streets, because she was not allowed into the city. There may well be PKK fighters hiding in Diyarbakır, as the government claims, but since reporters and other independent witnesses are kept out, there’s no way to know what’s really going on. In October, police raided pro-opposition media outlets belonging to the Koza İpek group after the government appointed new trustees to run the privately owned company. After firing key staff and appointing new editors, both print and broadcast outlets are now reliably pro-government. The government also effectively silenced another opposition broadcaster by ending distribution of its channels on the state-owned satellite platform. That was then; now the government is silencing critical voices. Perhaps the most dramatic example concerns Can Dündar and Erdem Gül, editor and Ankara bureau chief of Cumhuriyet, Turkey’s oldest daily, charged with spying, a coup plot and divulging state secrets. Perhaps the most dramatic example concerns Can Dündar and Erdem Gül, editor and Ankara bureau chief of Cumhuriyet, Turkey’s oldest daily, charged with spying, a coup plot and divulging state secrets. The men were arrested and jailed in November, six months after the paper published photos and a story about arms shipments trucked across the border, allegedly to Islamist rebels in Syria. Last week, Turkish prosecutors unveiled the indictment, seeking a life sentence plus 30 years. Most shocking of all, however, the plaintiffs in the case include Erdoğan himself (who had been prime minister at the time of the offending publication). This sent a clear signal, if one were needed, that the highest power in the land wants to see the journalists locked up for a long time. US Vice President Joe Biden met the Dündar family during his recent trip to Turkey (the pro-government press spun this as Biden saluting Turkish democracy) but European leaders have stayed mostly silent. Neither Francois Hollande of France nor Angela Merkel of Germany have spoken out about this case – or about many other Turkish abuses – though EU Commissioner Johannes Hahn denounced the high sentences they may face. Dündar and Gül share a cell, and colleagues say they are in reasonable spirits, with Dündar working on a book about the experience. Representatives from several media freedom groups, including the Committee to Protect Journalists and Reporters without Borders, went to Silivri Prison near Istanbul last week to try to visit Dündar and Gül, but were denied entry. Once a week the pair get closed family visits – that is, behind glass – and once a month, an open visit where visitor and prisoner can touch. Even if the government had a case and Cumhuriyet had threatened national security, jailing the editor and reporter for months without charge and threatening them with life sentences goes far beyond an acceptable response, and makes a mockery of any claims Turkey’s government has to respecting free expression as practiced in a democracy. Turkey has much to grapple with – 2.2 million refugees from Syria, and pressure from Europe to host millions more, bombings in Ankara and Istanbul that highlight the threat from ISIS, and renewed conflict in the southeast. That power cut in Istanbul only lasted an hour, but the darkness hanging over Turkey won’t end until the government ends its war on journalism.